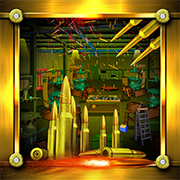 Description: 1658th-MISSILE IN SHAOLIN TEMPLE is a terrifying and click type new escape game developed by ENA Game Studio. Imagine a situation that you were in a Shaolin temple, where the terrorist kept the bomb inside the Shaolin temple. You have to defuse the bomb as soon as possible because the bomb will be destroyed in 90 minutes. It is sure that you will succeed by finding the necessary objects and solving puzzles. Have a greater excitement and fun by playing escape games daily. Good Luck and Best Wishes from escape games.